Ever since we introduced them to the natural foods market, our Whole Castelvetrano Olives and NEW Pitted Castelvetrano Olives have consistently been two of our most requested items! Their unique nutty, buttery flavor, mild brine and wonderful natural green color make them perfect to enjoy in salads, martinis, pasta dishes or right out of the jar! 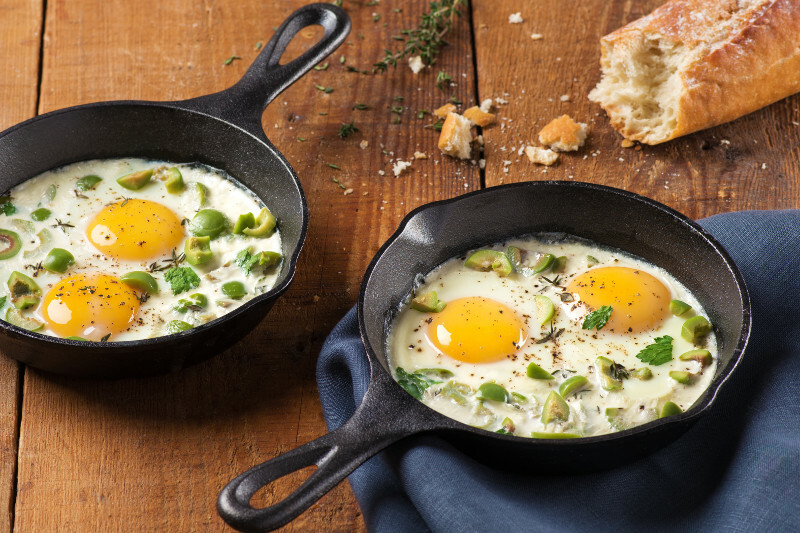 Crack 2 eggs into 2 individual-sized baking dishes. Season with salt and pepper. Drizzle a tablespoon of heavy cream into each dish, and distribute the olives and herbs into each dish. Bake about 6 minutes, until the whites are set and yolks are very loose. Once removed from the oven, the eggs will continue to cook for a few minutes. Drizzle eggs with olive oil and serve hot with warm crusty bread for dipping. Looking for more ideas? Visit our Recipe Page to find even more breakfast, brunch, lunch, snack, appetizer and dinner recipes to enjoy using Jeff’s Naturals all-natural line of olives, peppers, capers and sun-dried tomatoes.